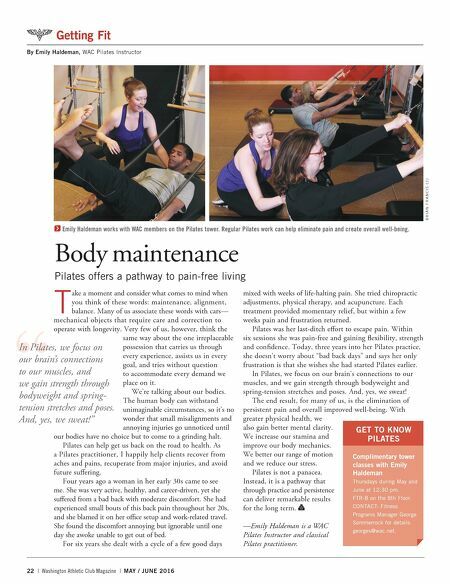 22 | Washington Athletic Club Magazine | MAY / JUNE 2016 Getting Fit Getting Fit By Emily Haldeman, WAC Pilates Instructor Body maintenance Pilates offers a pathway to pain-free living T ake a moment and consider what comes to mind when you think of these words: maintenance, alignment, balance. Many of us associate these words with cars— mechanical objects that require care and correction to operate with longevity. Very few of us, however, think the same way about the one irreplaceable possession that carries us through every experience, assists us in every goal, and tries without question to accommodate every demand we place on it. We're talking about our bodies. The human body can withstand unimaginable circumstances, so it's no wonder that small misalignments and annoying injuries go unnoticed until our bodies have no choice but to come to a grinding halt. Pilates can help get us back on the road to health. As a Pilates practitioner, I happily help clients recover from aches and pains, recuperate from major injuries, and avoid future suffering. Four years ago a woman in her early 30s came to see me. She was very active, healthy, and career-driven, yet she suffered from a bad back with moderate discomfort. She had experienced small bouts of this back pain throughout her 20s, and she blamed it on her office setup and work-related travel. She found the discomfort annoying but ignorable until one day she awoke unable to get out of bed. For six years she dealt with a cycle of a few good days mixed with weeks of life-halting pain. She tried chiropractic adjustments, physical therapy, and acupuncture. Each treatment provided momentary relief, but within a few weeks pain and frustration returned. Pilates was her last-ditch effort to escape pain. Within six sessions she was pain-free and gaining flexibility, strength and confidence. Today, three years into her Pilates practice, she doesn't worry about "bad back days" and says her only frustration is that she wishes she had started Pilates earlier. In Pilates, we focus on our brain's connections to our muscles, and we gain strength through bodyweight and spring-tension stretches and poses. And, yes, we sweat! The end result, for many of us, is the elimination of persistent pain and overall improved well-being. With greater physical health, we also gain better mental clarity. We increase our stamina and improve our body mechanics. We better our range of motion and we reduce our stress. Pilates is not a panacea. Instead, it is a pathway that through practice and persistence can deliver remarkable results for the long term. —Emily Haldeman is a WAC Pilates Instructor and classical Pilates practitioner. Emily Haldeman works with WAC members on the Pilates tower. Regular Pilates work can help eliminate pain and create overall well-being. B R I A N F R A N C I S ( 2 ) GET TO KNOW PILATES Complimentary tower classes with Emily Haldeman Thursdays during May and June at 12:30 pm. FTR-B on the 8th Floor. 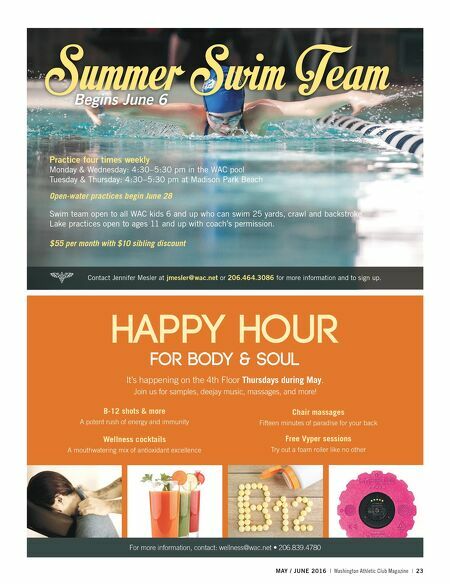 CONTACT: Fitness Programs Manager George Sommerrock for details: georges@wac.net. " In Pilates, we focus on our brain's connections to our muscles, and we gain strength through bodyweight and spring- tension stretches and poses. And, yes, we sweat!"